Scientists in the Arctic are warning that this summer’s record-breaking melt is part of an accelerating trend with profound implications. Norwegian researchers report that the sea ice is becoming significantly thinner and more vulnerable. Last month, the annual thaw of the region’s floating ice reached the lowest level since satellite monitoring began, more than 30 years ago. It is thought the scale of the decline may even affect Europe’s weather. The Norwegian Polar Institute (NPI) is at the forefront of Arctic research and its international director, Kim Holmen, said that the speed of the melting was faster than expected. “It is a greater change than we could even imagine 20 years ago, even 10 years ago. And it has taken us by surprise and we must adjust our understanding of the system and we must adjust our science and we must adjust our feelings for the nature around us,” Dr. Kim Holmen said. The institute has been deploying its icebreaker, Lance, to research conditions between Svalbard and Greenland – the main route through which ice flows out of the Arctic Ocean. During a visit to the port, one of the scientists involved, Dr. Edmond Hansen, said he was “amazed” at the size and speed of this year’s melt. “As a scientist, I know that this is unprecedented in at least as much as 1,500 years. It is truly amazing – it is a huge dramatic change in the system,” Dr. Edmond Hansen said. Key data on the ice comes from satellites but also from measurements made by a range of different techniques – a mix of old and new technology harnessed to help answer the key environmental questions of our age. The Norwegians send teams out on to the floating ice to drill holes into it and extract cores to determine the ice’s origin. And since the early 90s they have installed specialist buoys, tethered to the seabed, which use sonar to provide a near-constant stream of data about the ice above. An electro-magnetic device known as an EM-Bird has also been flown, suspended beneath a helicopter, in long sweeps over the ice. The torpedo-shaped instrument gathers data about the difference between the level of the seawater beneath the ice and the surface of the ice itself. By flying transects over the ice, a picture of its thickness emerges. The latest data is still being processed but one of the institute’s sea ice specialists, Dr. Sebastian Gerland, said that though conditions vary year by year a pattern is clear. Where the ice vanishes entirely, the surface loses its usual highly reflective whiteness – which sends most solar radiation back into space – and is replaced by darker waters instead which absorb more heat. 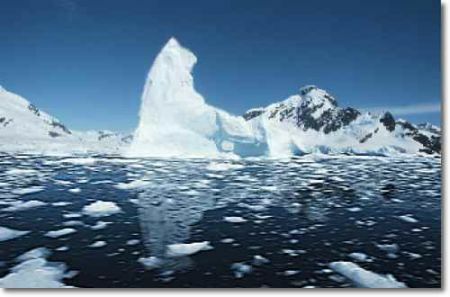 According to Dr. Sebastian Gerland, additional warming can take place even if ice remains in a far thinner state. “It means there is more light penetrating through the ice – that depends to a high degree on the snow cover but once it has melted the light can get through,” he said. The most cautious forecasts say that the Arctic might become ice-free in the summer by the 2080s or 2090s. But recently many estimates for that scenario have been brought forward. Early research investigating the implications suggests that a massive reduction in sea ice is likely to have an impact on the path of the jet stream, the high-altitude wind that guides weather systems, including storms. The course and speed of the jet stream is governed by the difference in temperature between the Tropics and the Arctic, so a change on the scale being observed now could be felt across Europe and beyond. Kim Holmen of the NPI explained how the connection might work. “When the Arctic is ice free, it is not white any more and it will absorb more sunlight and that change will influence wind systems and where the precipitation comes. That assessment is mirrored by work at the European Centre for Medium-Range Weather Forecasting, based in the British town of Reading. The centre’s director-general, Alan Thorpe, said the link between the Arctic melt and European weather was complicated but it is now the subject of research.